2 bedrooms, 1 king ,1 queen, plus top of the line full sleeper sofa,. 1 full bathroom, all remodeled. Fully equipted kitchen featuring dishwasher, microwave, full size refidge and under counter bar fridge. Huge front deck, all under cover, upper level all open and a large side dock (12x40) for outdoor games and sun. Plenty of area around the house to park your boat and/or swim in the beautiful clean water. Located in the harbor of Shanghai Marina. Privately owned, not affiliated with the marina. 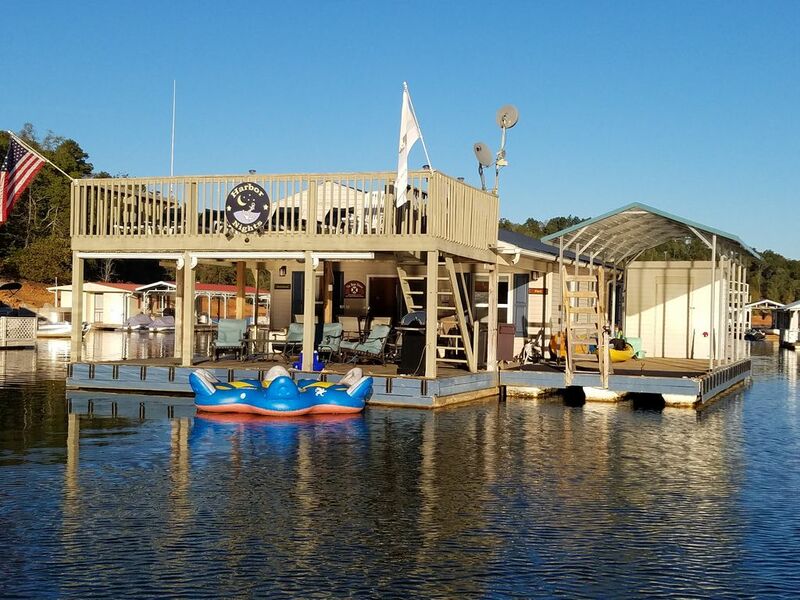 If you find this property is booked - PLEASE visit our NEW 2nd Floating Cottage Location in same marina (Summer's Pleasure) Listing #1133379. We are Randy & Paula Johnson. During the summer, we live on our floating house right next to our 2nd rental (listing#1133379) which is right next to this house. . We have been at Shanghai since 1995. We have owned our own business for over 30 yrs. The 2018 season will be our 5th summer for renting. This floating house docked in one of the nicest marinas on Norris Lake..... "Shanghai Resort & Marina". It's been completely renovated during the winter of 2013, so everything is new. Inside is approx 900 sq ft, which includes 2 bedrooms, fully equipped kitchen, full bathroom, as well as a living room with a full size fold out bed. Plenty of room for boats to park around this house, and the water is so nice to get in just to float and relax. Bring your boat or Shanghai Marina has pontoons, ski boats and PWC available to rent. They also offer a full service restaurant and bar with 15 beers on tap! Nothing better than to wake up literally ON the water. Look out your windows to see water all around you. Plenty of outdoor seating as well as indoor seating. A/C keeps the house cool in the hot summer days, but we find floating in the clean clear water to be most relaxing way to spend a day. Large All newly remodeled including a corner tub/shower, vessel sink, linen cabinet and makeup station. Giant ( lake) right outside your door. The kitchen is more than "stocked" with any and all available cookware and dishes and pots and pans. We have a blender, crock pot, mixer, Electric knife and an outside griddle. We have several spices in the pantry and have provided paper towels, coffee filters, napkins, tissues, foil, Saran wrap and cooking oils. If you forgot it and or don't see it, just ask Paula. Wonderful week on the beautiful lake in the perfect private home! Had an amazing vacation! This place is paradise - it’s clean & fun- a perfect off the grid getaway! great place to relax and do some extreme tubing!! Loved this floating house! The house itself was decorated beautifully, was clean, and included everything you need accept for clothes and food. The outdoor living area was just a good if not better. Big bonus is the washer and dryer that kept all our wet stuff from smelling like the lake. I loved waking in the morning and having my coffee in the sitting area 3 feet from the water. It has plenty of shade as well as the upper deck for those sun bathers. The place comes with plenty of water toys, paddle board, kayaks, floating devices for times when you are hanging out at the house. This is our first time at Norris Lake and I was surprise there was no floating driftwood or debrie and it's true what they say, the lake is clearer than most lakes. There are also several marinas with restuarants if you'd rather not cook during your stay. The only negatives would be no cover for your boat, the day the pooper scooper guy comes can be smelly, just plan to be out and about that day, no marinas on Norris Lake sell fishing license, and neighboring house boats are close so depending on your neighbor could be a problem with noise. The owners were super easy to work with and responded to questions quickly and honestly stock the house with everything needed and if you find something you need that isn't there, they are just 2 houses down, just ask! We are definitely considering renting this house again next summer! We had a fantastic stay in Harbor Nights! Randy and Paula have it very well stocked and ready for their guests and are close by if anything out of the ordinary arises (huge plus!). Our absolute favorite feature of the house is the outdoor seating - you can be in full shade or full sun - whatever your preference. We also loved being able to cook the majority of our breakfast each day outside at the bar area. We will definitely book Harbor Nights again! Harbor Nights was the perfect place to have our yearly girls trip! So many different places to sit around for coffee and end with wine. So peaceful! Randy and Paula were awesome! I will be back with my family soon! Lovely home and we'll equipped. Randy was very accommodating and made sure we had everything to make our stay just perfect. Incredibly well equipped and comfortable! So great to just roll out of bed and be on the water!! $65.00 cash cleaning fee due at check in.